I’ve suffered from abibliophobia all my life, but until recently I had no idea some kindred soul had coined a name for the problem. Mind you, there’s no chance of running out of reading material in my house. Along with the shelves of book I Really Want To Read, there are whole walls of books I can’t give up because I might want to read them again one day. But I never go anywhere that might involve a waiting room or a meal eaten alone without a book (or these days my Kindle). The truth is, I’m an incurable bookaholic, and I have no desire to change. There are far more dangerous (or anti-social) addictions. A couple of weeks ago I stopped at the local Barnes & Noble, armed with a Christmas gift card, and bought one book, a lovely large volume called Steampunk: An Illustrated History of Fantastical Fiction, Fanciful Film and Other Victorian Visions by Brian J. Robb. I’d spotted the book on line and bought it brick and mortar; on the same trip I spotted several books at the store to order on line. I have gift cards for Amazon, too, and they stretch farther. Yesterday I made another stop at Barnes & Noble, gift card balance in hand, but I didn’t buy anything. The particular book I was looking for hadn’t hit the shelves yet, and I knew that the box of books I’d ordered from Amazon was due to arrive. And sometimes I find a bookstore the size of B&N overwhelming. So many, many books that I would like to read. So many, many books that I will never have time to read. So many, many books that I should be writing myself. 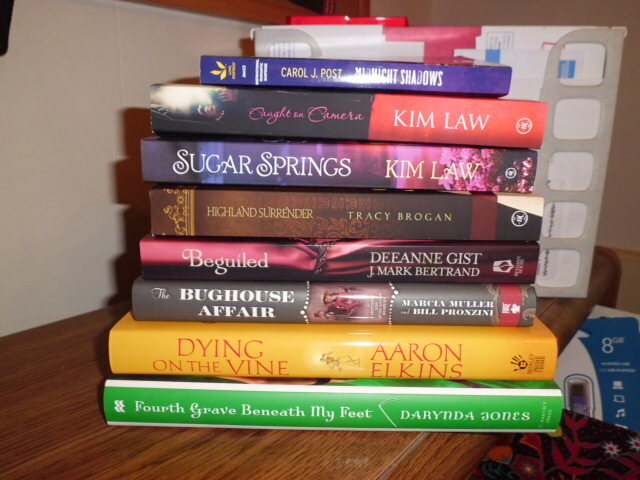 When I got home from my errand-running rounds, the big box of books from Amazon was waiting on my doorstep. Four of the books are recently released romances by my Firebird sisters (that group is beginning to make me feel like a serious underachiever! ): Highland Surrender by Tracy Brogan, Midnight Shadows by Carol J. Post, and two by Kim Law, Caught on Camera and Sugar Springs. Beguiled, by Deeanne Gist and J. Mark Bertrand, is a romantic suspense novel set in Charleston. Dee used it as an example in her workshop on research, and it was the only one of her books I didn’t have, so when I saw it on sale at Amazon, I clicked it into my cart. Darynda Jones’ latest tale, Fourth Grave Beneath my Feet is the latest release in her series. I’m running behind on those; I’ve read First Grave on the Right (a Golden Heart winner), but Fourth Grave will be joining Second and Third on the TBR pile. For pure mystery, I’d ordered Aaron Elkin’s latest Gideon Oliver novel, Dying on the Vine. I’ve been reading this series since the beginning. I’ve also read Marcia Muller’s Sharon McCone novels since the beginning (the latest is wating for me), so I couldn’t resist The Bughouse Affair, the first in a new historical mystery series set in 1890s San Francisco by Muller and her husband, Bill Pronzini. I should be able to hold off the Heartbreak of Abibliophobia for a good while yet. Say, the next twenty-five years or so. Good to know we’ll escape “the heartbreak of abibliophobia.” You crack me up, Kay. Oh, you know me, Pat, always going for the punch line. But I have an appointment at my dentist’s office in the morning, and you can be sure I’ll have my Kindle along.